A little internet research yielded an address in American Fork, and a few hours later I drove up to an old historic structure with an ancient fire truck parked out front. The eclectic assortment of windows, birdbaths, baskets, and ironwork on the front steps let me know I was in the right place. 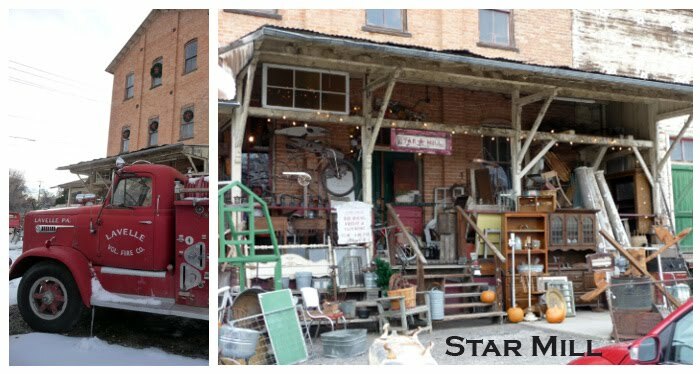 Star Mill is far too nice to call a “junk shop.” It’s also way too rugged and real to call an antique store. 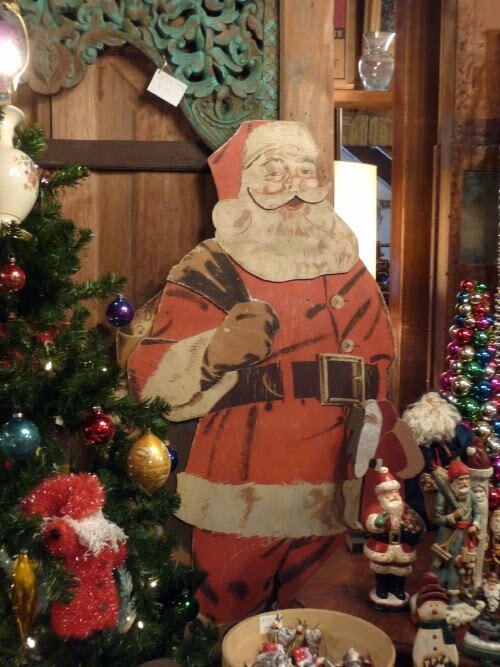 (No disrespect to antique stores intended.) I prefer to call it a “treasure trove.” If I were looking for old doors and window frames for a restoration project, I’d find them here. If I were looking for a collection of old LDS titles and historical novels, I’d find them here. If I were looking for a full set of vintage china, I could find it here. 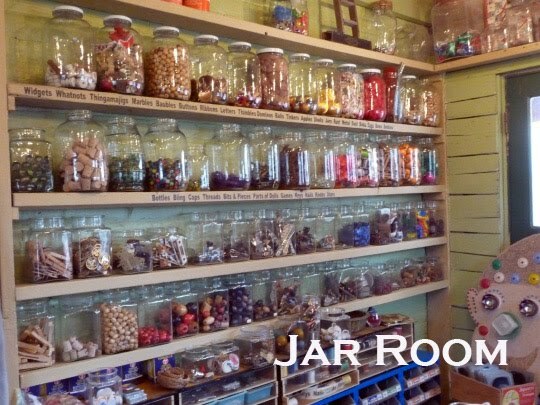 My favorite room in the Star Mill is the Jar Room. 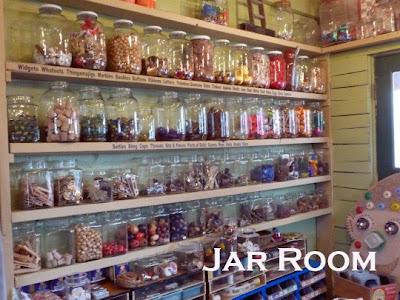 The walls are lined with large glass jars filled with bits and bobs: marbles, hinges, game pieces, springs, corks, and clothes pins. I treated myself to some old bingo cards and a few medicine bottles. I think I’ll turn these into some creative Christmas cards. A few days later, I persuaded a friend to return with me, and I asked her to choose an odd piece of “junk” for me to present on my blog. “But not too big,” I said cautiously, eyeing an old iron stove. And so, dear readers, I give you…this. Whatever it is. It’s a black, iron scroll-work, vaguely bowl-shaped thingy with some kind of iron protuberance at the end. And I ask you, what shall I do with it? What can I turn this in to? Please give me suggestions in the comments section. 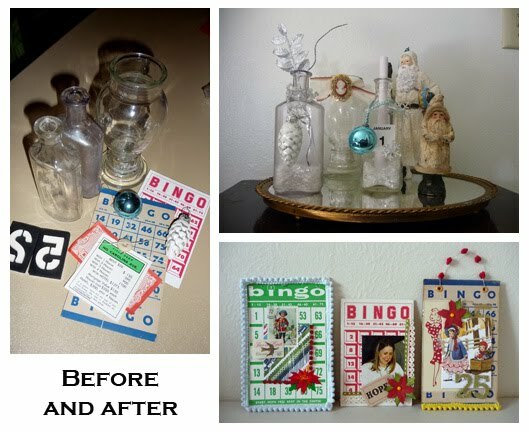 I’ll take the most interesting suggestion and post my…er…artistic endeavor…on the blog. Additionally, there will be a prize for the person whose idea I select. I could create an entire photo journal of just the nooks and crannies in Star Mill. Many photographers do choose Star Mill and its surrounding property as the backdrop for their portraits. For just $40 photographers can shoot around the barn and the mill as well as the field and the lane lined with trees. The famous green doors of the Mill itself make a fantastic rustic backdrop for family members grouped on the old weather-worn steps. Or imagine a photo of your family walking down the snowy country lane. This is the perfect setting for your family Christmas photo. Just call Star Mill at 801-756-0464 to make arrangements and let them know you are coming. Headgear for next year's Senator Amidala costume. I think something for your Halloween collection. It's got that Gothic look. You could make a chandelier with ribbon and crystals hanging from it. Maybe in a girls room? Or even a cute mobile for a baby girl. You could also use it as a plant holder. If you did that you could spray paint it a brighter color so that it shows. Like maybe the bottom of a topiary? Love your blog, found it throught the Ice Castle Blog. I love this place, although I've never been...someday! I also was going to say some sort of a light fixture thingey.